Looking for excuses to get outside and see the best Fall Foliage in New England? You would be hard-pressed to find a better place than Jackson NH, which was named among the top 25 spots in New England to view autumn leaves. Fall is truly an amazing time of year to visit the White Mountains and stay at the Christmas Farm Inn & Spa. Forecasters expect a dazzling show as long as sunny days and cool nights continue. With such a late start, we should see the colors into late October. The Christmas Farm Inn & Spa is just minutes from the Kancamangus Highway, which is a must for every traveler seeking a scenic drive. 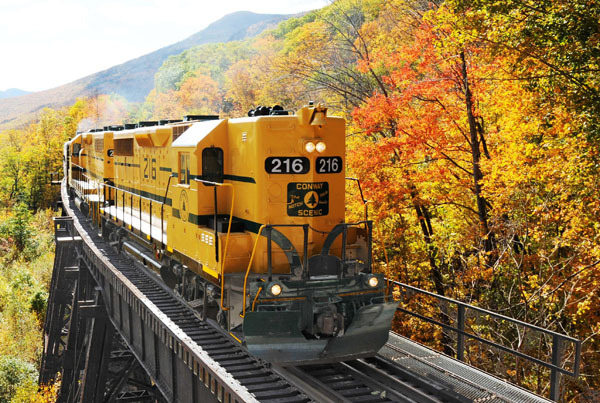 The “Kanc” runs for 37 miles through the White Mountains. The Mount Washington Auto Road is another awe-inspiring attraction with changing scenery as you climb the roadway and enjoy amazing views for miles away. You’ll definitely want to record your adventure to share with your friends later. Lace up your walking shoes and hit the trails to get up close and personal with nature. The beautiful rock slabs around Jackson Falls make for a relatively easy trek. The Route 16 Loop in Jackson Village takes you from the covered bridge to river crossing. Wherever you decide to go, it’s good to remember a car isn’t critical to see a great show. The Christmas Farm Inn & Spa is conveniently located on 15 acres of wooded land within walking distance of the gorgeous Jackson Falls. You can hop on the Conway Scenic Railroad if you prefer to sit back and gaze out of a train car window. The local Kiwanis and Habitat for Humanity are holding a special excursion fundraiser, the Autumn Express, on Oct. 15th to benefit local families and children’s charities. You can also take the Cog railway to ascend Mt Washington. It’s a slow ride, but may be preferable to driving if you are afraid of heights. You can hop on the Conway Scenic Railroad if you prefer to sit back and gaze out of a train car window. The local Kiwanis and Habitat for Humanity are holding a special excursion fundraiser, the Autumn Express, on Oct. 15th to benefit local families and children’s charities. Of all the subjects that make great material for a camera, taking pictures of the fall leaves is possibly the best. Professionals and amateurs alike can get great photos of mountainsides packed full of vibrant saturated colors. Your Instagram will be the envy of your friends back home when they get a glimpse of the WOW factor in your snapshots. You can pick up apples, gourds or a pumpkin from the Hatch Orchard or drop by the Sherman Farm, where they have a corn “maize” for finding your way out of. They have goats to pet, corn kernels to play in, and a “moo train” for youngsters. You don’t want to miss the Columbus Day Sidewalk Sale at Settler’s Green! Sometimes the best way to see the fall colors is from a high altitude. Again, you can go for Mount Washington or opt to look down from a Cannon Mountain Aerial Tram in Franconia, a helicopter ride or soaring along ziplines from one of the area resorts. This time of the year offers more than just pretty leaf views at every turn. The whole month of October brings the great annual tradition, The Return of the Pumpkin People. Christmas Farm Inn & Spa is just one of the many local businesses who go to great effort to create entertaining displays out of pumpkins. As the recipient of top honors last year, the staff at Christmas Farm Inn & Spa are hard at work on this fall’s version. Self-guided tours make seeing these quirky and hilarious displays easy. Kids will love visiting local pumpkin patches and finding their way out of the Sherman Corn Maize while teens and adults enjoy experiencing a tinge of fear at the Ghoullog, the annual “haunted house” at Cranmore Mountain. It’s frightening how much fun you’ll have! There are plenty of activities and seasonal charm to make your trip to the White Mountains truly memorable in October.